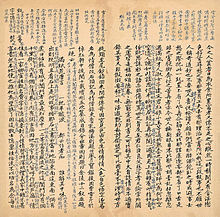 A page from the 1759 "Jimao manuscript" of the novel. ^ Yu, Anthony C. (2001). Rereading the Stone: Desire and the Making of Fiction in Dream of the Red Chamber. Princeton University Press. p. 9. ISBN 0691015619. ^ Jonathan Spence, The Search for Modern China (New York: Norton, 1990), 106–110. ISBN 0-393-30780-8. This page was last edited on 24 February 2019, at 02:47 (UTC).